5/10/13 12:46 p.m. update: Due to popular demand, we’ve increased this Hookup from 30 pairs to 50 pairs! CHICAGO – In the latest HollywoodChicago.com Hookup: Film with our unique social giveaway technology, we have 50 pairs of movie passes up for grabs to the advance screening of “The Iceman” (a true story!) starring Michael Shannon and Winona Ryder! “The Iceman,” which is rated “R,” also stars James Franco, Stephen Dorff, Ray Liotta, Chris Evans, David Schwimmer, Danny A. Abeckaser, John Ventimiglia, Ryan O’Nan, McKaley Miller, Megan Sherrill, Hector Hank and Robert Davi from writer and director Ariel Vromen and writer Morgan Land. To win your free “The Iceman” passes courtesy of HollywoodChicago.com, just get interactive with our unique Hookup technology below. That’s it! This screening is on Monday, May 13, 2013 at 7 p.m. in downtown Chicago. The more social actions you complete, the more points you score and the higher yours odds of winning! You must be 17+ for this “R”-rated screening. 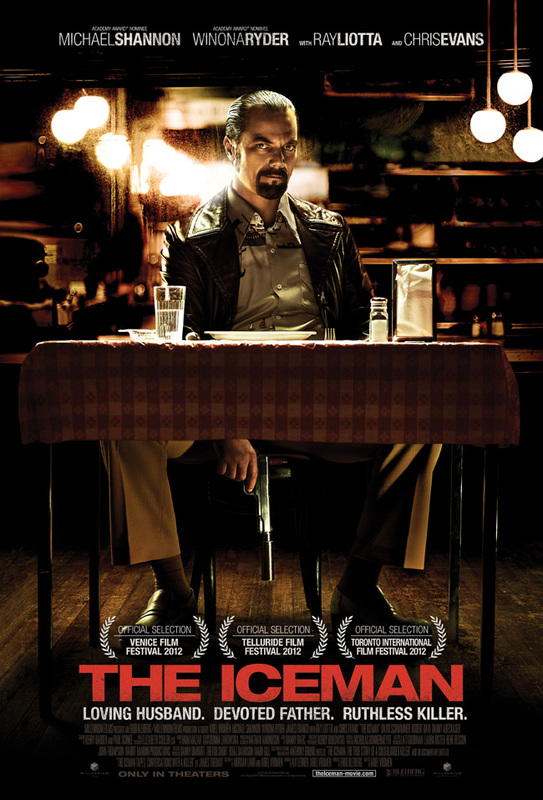 “The Iceman” is the true story of Richard Kuklinski: the notorious contract killer and family man. When finally arrested in 1986, neither his wife nor daughters have any clue about his real profession. The movie poster for “The Iceman” starring Michael Shannon and Winona Ryder. The trailer for “The Iceman” can be watched now below. This HollywoodChicago.com Hookup is simple! Just get interactive in our unique Hookup technology above. We will award 50 admit-two movie tickets based on social entry numbers and/or randomly via e-mail for our “The Iceman” Hookup. Good luck! Winners need to arrive early as seats are consumed on a first-come, first-served basis. Since showings are overbooked to ensure a full house, winners are not guaranteed entrance and must arrive early. We recommend arriving 45 minutes before the showing’s scheduled start time. HollywoodChicago.com LLC is a promotional partner with the studio and its partners and doesn’t assume any liability for this giveaway. HollywoodChicago.com is not responsible for errors or omissions entered in user submissions. Comments are closed in this Hookup.